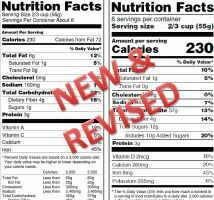 You are you probably aware that the nutrition facts label has been updated, but do you think your students are aware of the changes made? My guess is that most students will have no idea that the nutrition facts labels have changed or why. So, with that mindset I put together some activities to not only show students the differences between the old and new labels, but to have them put themselves in the driver’s seat and create their own updated version of a nutrition facts label first. This gives them an idea, as a team, how to approach a problem, critically discuss possible changes based on what they know and then come up with a final revision. Finally, they will explore why actual changes were made to the current nutrition facts food labels. You and your team been asked by the FDA to create a new nutrition facts label design for food products. The old one hasn’t been updated in 20 years and needs a makeover. Brainstorm (individually or as a team) the issues facing the health of American’s today. An example: Obesity is the leading health concern among children, teens and adults. Look at the list your team has created and think about the changes you would make to the nutrition facts label design and why. Choose at least one change per team member to include in the updated design. Use the editable copy of the current Nutrition Facts Label from TPT. Recreate it to reflect all of the changes your team has decided on and using Google Docs, add additional slides explaining each change you made and why. Remember…you need to make at least one change per team member. You and your team will be presenting and explaining the updated changes/new label design to the class. After all of the groups have presented their new nutrition facts labels, discuss that the FDA has done just what they’ve done and updated the nutrition facts label to reflect current dietary guidelines and health issues. Project the old and new versions of the nutrition facts label onto the screen and have students compare and contrast the changes made in the update. Here is a link of the side by side comparisons. There are also handouts here explaining the changes. Using this freebie from Learning Zone Express, have student teams dig deeper, using the internet and current health articles to help them form responses to the Dig Deeper Questions/Prompts. Finally, discuss their findings along with the actual responses included in the Learning Zone free resource key found in the freebie link above. ← Technology, Sewing & Fashion: What’s New?